Prior to the implementation of the single spine, health workers were on a salary scale called Health Sector Salary scale (HSS). When doctors were migrated onto the single spine, the basic salary on the single spine was lower. Now the pension deduction is made solely on the basic salary and it is against international labour regulations to make a worker worse off, migrating from one pay scale to another. This worse off could be in terms of overall take home or pension deductions. Now according to the government white paper governing the single spine salary structure, whenever the single spine’s basic pay is lower than the basic pay of whichever scale one is migrating from, an amount called conversion difference is to be paid to that individual to bring the person to parity with the salary on the pay scale being migrated from. This has a two-prong effect; first, it ensures that nobody takes home a reduced salary and second, that the person’s pension is maintained. When the single spine was implemented for doctors, the conversion difference was paid and everything was fine until we realized that our pension deductions had gone down. When we made enquiries, it came to light that the Fair Wages and Salaries Commission (FWSC) had given the order for the conversion difference to payment to be stopped. We raised the issue with our sector ministry and amidst denials from the FWSC; they eventually accepted that they had given the go ahead for Controller and Accountant Generals (CAGD) to recover the conversion difference. A series of meetings ensued culminating in the ministry of Finance communicating to the CAGD not to recover the conversion difference until the issues have been resolved. The FWSC, demonstrating their penchant for breaching every agreement reached, unilaterally instructed the CAGD to recover the conversion difference. Since January 2012, every attempt to get it restored has proved futile. You name the institution that has not been consulted? The National Labour Commission, Ministry of Health, Office of the president and even National Security are all but a few of such institutions. They all demonstrate remarkable understanding of the issues and yet do nothing about them. Interestingly, in all the discussions on radio and other media about this strike, very little is mentioned of this Conversion Difference and its attendant lowered pension deductions. The other thorny issue is the market premium. Again according to the Government White Paper on the single spine, this is an amount paid to attract and retain some skills that are in short supply. A negotiating Committee was set up and when there was a deadlock, the NLC called for compulsory arbitration and gave a ruling. The ruling, just like the proposal from the FWSC as well as from the GMA, was a percentage of the base pay. This ruling was given in 2011 but the single spine took retrospective implementation from 2010. It so happened that the 2010 base pay was lower than the 2011(because there was a ten percent raise for 2011). When it came to the implementation of the market premium for 2010, FWSC rightly calculated it based on the 2010 base pay which was lower than the 2011 base pay. In 2011, the market premium again was a percentage of the basic salary exactly as the Labour Commission had instructed. Come 2012, the FWSC, demonstrating their contempt for the NLC ruling, unilaterally decided not to pay the market premium as a percentage anymore. So while the prices of goods and services were going up by the day, doctors purchasing ability was reduced with the stroke of FWSC’s pen. Yes just like that! The Ghana Medical Association has been seeking amicable solution to this injustice. The concerned state institutions all accept the fact that we have been cheated but nobody is bold enough to correct the wrong. As far back as May 2012, after a National Executive Council meeting at MPlaza hotel in Accra, a roadmap was drawn and rolled out. Soon after, there were all sorts of meeting with the various stakeholders notably the National Security. The roadmap was suspended because of these “favorable” overtures from government. As to be expected, all the institutions mandated to deal with these issues went to sleep as soon as the threat was removed. GMA sent the issues to the NLC in October 2012. The NLC called for compulsory arbitration and wrote to both GMA and FWSC to confirm the issues to be arbitrated on which was duly obliged. On the day that the arbitration was to commence, however, we were told that one of the arbiters had developed diarrhea and a new date was to be communicated to us. We pushed and shoved and still NLC refused to call for the arbitration. The diarrhea never resolved well into months. In November 2012, at our Annual General Conference held in Cape Coast, members assembled resolved to reactivate the roadmap but because of the impending elections, it was to take effect two weeks after the swearing-in of the incoming government. At the first National Executive council meeting of GMA held on 25th January 2013, the roadmap was reactivated. Shamefully, the NLC which has declined a meeting all these while suddenly found its voice to call for one. Perhaps the diarrhea suffered by the arbiter just got resolved! At the meeting their main preoccupation was to get GMA to remove the threat of strike and not to solve the problem. After hearing both sides, the NLC ruled that their earlier decision where the market premium was a percentage of the basic salary should be respected. In fact the NLC chastised FWSC for unilaterally varying their ruling and admonished them to refrain from such actions. As to be expected, even after the NLC ruling, FWSC refused to budge. Our expectation at this point was for the NLC to go to court to enforce their ruling according to the dictates of the Labour Act. NLC never enforced their ruling till early February this year when GMA again reactivated its roadmap. Soon after there were all sorts of promises and committees with one set up to even to be chaired by the Vice president. Good faith was exhibited by GMA and the strike was called off after two days. The vice president committee is yet to call for its maiden meeting and rightly so – afterall was the strike not off? Whilst waiting for the Vice president committee, the GMA again called on the NLC to enforce their ruling. After two meetings, FWSC finally accepted that they have erred and agreed to pay the arrears. A committee chaired by the director of grievances, Cornelius Yawson met us twice. At the second meeting, Mr. Yawson refused to sign the minutes compiled by his own Lawyer because he insisted on using the caption “interim market premium.” What was never in contention and which was duly captured by the minutes was that FWSC owed doctors 14 months arrears back in February 2013. At this meeting, FWSC proposed a payment schedule starting in March 2013. GMA reasonably had backed down on its insistence of a one tranche payment to a three month schedule without breaks as against FWSC schedule with breaks. You can then imagine our surprise when, at a meeting to finalize the payment schedule, three weeks later, when the CEO of FWSC suddenly insists that the arrears are only for 2012 and even while paying the arrears for 2012, the market premium for the months in 2013 will be based on 2011 figures. This basically means that after 2012, doctors salaries will actually reduce in 2013! The NLC ruling being trampled upon by FWSC again! This issue was sent to NLC and to my chagrin, the NLC, whose ruling is being varied by FWSC now begs us to accept FWSC’s proposal! NLC backed their cowardly act by ruling that they have “adopted” FWSC’s schedule with no mention whatsoever made of the 2013 arrears and the conversion difference and reduced pension! NLC committed suicide by allowing government to dictate to them. Now we have two contradicting rulings from the NLC, accounting for why NLC cannot describe our strike as illegal. If NLC had gone to court to enforce their ruling when FWSC refused to abide by it, there will still be trust for the NLC. For now though all trust and respect for the NLC is gone. As for the FWSC, the least said about, it the better. On Sunday the 14th of April, the National Executive Council on GMA met to deliberate on what government has offered. I place on record here that the GMA has accepted the Market Premium arrears schedule proposed by the Ministry of Manpower and Labour. I stress this because the media seems to have concentrated on the fact the Doctors are demanding a one tranche payment. The decision not to scale the action up i.e not to withdraw seeing emergencies was premised on the numerous appeal we have received including the National House of Chiefs, the Okyehene and other civil society organizations, our respect for the mediation role by the T.U.C as well as the agreed schedule of market premium arrears Proposed by Government. Interestingly, the Minister of Health has yet to even call on the GMA to at least ascertain what the problems are! The continuous withdrawal of OPD services was based on the untouched discussion on the Conversion Difference and the inconclusive discussions on the pension of doctors. The one week grace period is to allow for a final determination of the above outstanding issues. I hope that government will not again unleash its propaganda machinery to paint us black again. Let sober minds reflect. What do you think about the doctors’ strike? Read Dr Boateng’s GhanaWeb health blog on the recent strikes here. All this; for money? Arrears? I am ashamed and I can’t decide who to blame just yet. I am saddened. In the mean time I will beg our doctors to get back to saving our lives. As for the negligence and sheer lack of professionalism shown by government, I can say this stinks like the bottom of it all. At a time like this I wish Mahama hadn’t raised the salaries and ex gratia for members of parliament and his government officials to ridiculous amounts. That is completely unacceptable. So I wish I could point some fingers. But I will refrain from it for now. I would like to join Kofi Annan and Nkruma here in begging doctors to go back to work while we put some much needed pressure on this lame government to find an amicable solution to this problem. Manka a na mebua! Ghana na ya sei ni se? My friends, thanks for sharing but I blame this government. You cannot pay doctors their due? I don’t care how much they make. A deal is a deal. Pay them and make the doctors go back to work and work harder. Fact is insulting the government does not solve any issues, it makes it even worse. The more you insult a fool, they more stupid things they actually do. Come to think of a country in the 21st century that cannot eradicate the common mosquito which kills thousands of its citizens a year. I know it is not hard to fathom a better more committed government but we have to caress these idiots like eggs any how. All I hope is that Mahama’s government is not deja vu for those of us who may have believed in him. This situation should not have deteriorated into what it is now. But it has and though it’s a major blow to Mahama’s government I can only still wish them the best – the sense to finding a quick fix to this. People are dying. Plus, our doctors need to understand something. Leaving sick citizens to die at the cost of a few more GH Cedis is probably not the wisest thing to do. This scars the integrity of the profession as well. The only way they can regain some respect among us is if they went back and worked, saved lives and worked even harder. The government consists of a bunch of idiots, yes! And these fools are already making poor Ghanaians suffer. Doctors, I plead, should not make it any worse. Maybe doctors were getting paid too much before. Maybe this is how much they are really worth, considering how many people they kill everyday at Korle Bu and the rest. If paying doctors arrears saved poor lives and if paying doctors more saved more patients, then I can agree with this. But doctors are already milking a system that demands little accountability from them. They really shouldn’t be complaining at this point. This is becoming an epidemic in Africa. 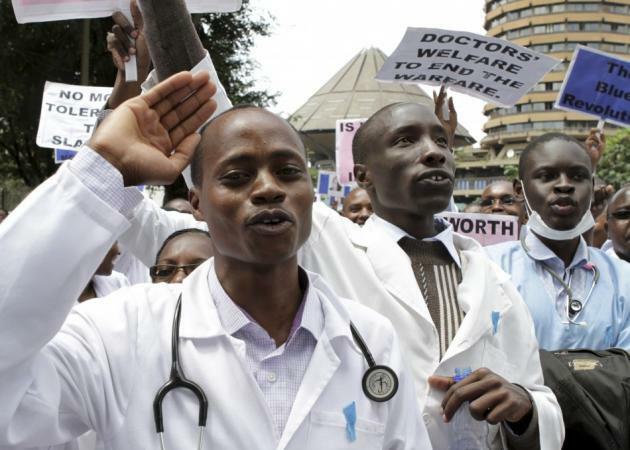 Doctors striking at will in Ghana, Kenya and so on. Why? I am sure we will do ourselves some good by realigning our duties to our states in a profound way. If doctors in Ghana saw themselves in the shoes of our good old days herbalists etc. who took little for the services they provided to our communities and if the Ghanaian government had its citizens as its prime concern, this would not happen. But as I see it, capital is perhaps making us lose our African souls in very profound ways. I hope by capital you are not condemning capitalism. Every system carried to excess is harmful but I find less cons with capital than without it. Ghanaian doctors have a point. The working conditions are deplorable and the pay cannot be reduced when it has been raised across the board for other public servants. However, I can agree that keeping faith in the things that make us human – caring about one another – should be the cornerstone of all Africans. After all, what do we gain by conquering the whole world but lose our African souls? Nothing! I beg doctors to reconsider on this point alone and leave the scolding of an infantile government to our behest. We’ll make sure they get paid or Mahama is toast in the next elections.